Get the tree netted before leaving the lot. Make sure to place a tarp or blanket beneath the tree in your trunk or on the roof. If the tree is on the roof, make sure the trunk is facing the front of the vehicle. 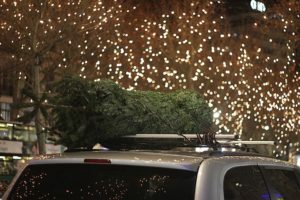 Secure the tree with rope or cord, and give it a test pull before leaving the lot. If the tree is longer than your car, tie a flag to the end to make sure other drivers take notice. Drive slowly. Having a heavy item on the roof can throw off your car’s center of gravity. Listen to the employees at the lot. They know what they’re doing and want to make sure you and your tree make it home in one piece. Nothing is more of a holiday buzz kill then getting home to find a broken tree or scratched up car. Millions of needles hiding in the crevices of your cargo area aren’t any fun either. Follow these tips to keep your car in top shape this season!